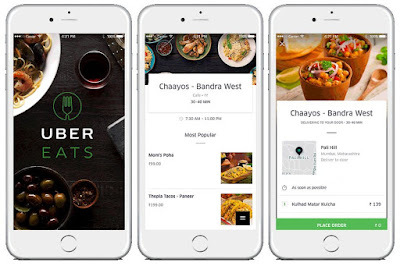 Uber today launched UberEATS in India, with Mumbai the first city to go live with the service. An on-demand food delivery app, UberEATS helps bring food to consumers in a convenient and reliable manner. From specialty local favorites to everyday national brand names, UberEATS will make it possible for Mumbaikars to enjoy their favorite food every time, everywhere. To make all this possible, Bhavik Rathod has been appointed to lead UberEATS in India and spearhead UberEATS expansion across the country. Here are the unique technology features built in UberEATS app to deliver on the promises of selection, speed, and convenience. For Consumers (Users) - UberEATS helps users discover new foods and enjoy more of what their cities have to offer. ● Smart Curation & Specialization - This feature allows users to view food photos and allows broad cuisine search for a mouth-watering experience, while the suggestion carousels bubble up restaurants which users will love. The application of machine learning enables creation of individualized taste preferences, and customised restaurants and dishes for each user based on their past orders and current contextual information. Now consumers can easily find and order the right food for the moment at the push of a button. ● Scheduled Orders - For those in a rush, UberEATS brings the intersection of convenience and reliability, UberEATs offers consumers the capability to schedule an order ahead of time. Consumers can order anytime up to an hour before the desired delivery window, and as far as a week in advance. The app lets the users track their order through every step of the process, so that consumers can monitor their order and be assured of their order being reliably delivered to their location. ● Customize drop-off - Expanding delivery to more places in India, customize drop-off feature gives more choice and convenience to consumers. Now consumers can get food delivered with ease and convenience no matter where they are by choosing specific information about delivery location. Some of the places getting added to UberEATS delivery are hospitals, parks and office buildings. For Restaurant Partners - UberEATS will help local restaurants reach new consumers and deliver their food fast, efficiently and reliably. Offering a reliable turnkey delivery option, UberEATS effectively expands restaurant capacity and reach to be able to service a whole new network of potential consumers and significant additional revenue stream. ● Restaurant Manager - The app makes it simpler for restaurant partners to control order flow, manage menus, and improve exposure. Restaurant Manager, a new analytics tool has been rolled out to empower restaurant partners to make data-driven decisions. The tool offers restaurants access to actionable data and insights about their service quality, consumer satisfaction, and sales to help make specific adjustments to improve their business. ● Guided Pick-ups - For delivery partners, parking and picking up from restaurants is a highly variable experience based on the location and configuration of the restaurant. UberEATS has built in step-by-step pick-up instruction functionality, wherein Uber delivery-partner app gathers granular pick-up information for even the most difficult-to-navigate restaurants, share that with delivery partners so they can quickly and easily locate the order as well as deliver it on time. Food prices are set by restaurant partners according to their own menu and there’s a delivery fee of INR 15, inclusive of taxes. There is no minimum order size.